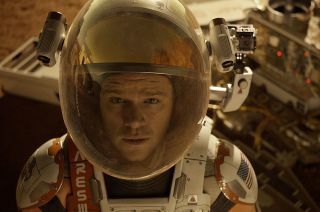 Astronaut Mark Watney (Matt Damon) is stranded on Mars, in the new Ridley Scott movie, "The Martian." Edward Belbruno is a mathematician and an artist. His paintings are in major collections and exhibited throughout the United States, and he regularly consults with NASA from his position as a cosmology researcher at Princeton University. He is also author of "Fly Me to the Moon" (Princeton University Press, 2007). Belbruno's art is available exclusively in the Space.com store. Belbruno contributed this article to Space.com's Expert Voices: Op-Ed & Insights. Spoiler alert: This essay contains spoilers for the film "The Martian"! As I read "The Martian" (Crown, 2014), I couldn't put it down. Full of cliff-hangers, where you don't know what's going to happen from one moment to the next, the book depicts astronaut Mark Watney, mistakenly left for dead as his fellow crewmembers hastily escape a storm on Mars. Left stranded on the Red Planet, he's totally alone, with little food or air. Everyone on Earth thinks he's dead, including his former crewmates. And yet, using his incredible survival skills, takes care of his basic needs, just barely, and manages to communicate with NASA using an expired rover left on the Martian surface years before. How cool is that? That happens when both the Earth and Mars are at their respective closest distances to the sun, called their periapsis locations. This configuration, paired with the spacecraft technology available today, would result in a flight time of about 234 days using a Hohmann transfer. The spacecraft must leave the Earth with just the right velocity and at just the right time. The transfer itself goes from Earth to Mars in a direct path, which looks like half of a big ellipse with respect to the sun, starting at the Earth and ending at Mars. However, when Watney finds himself stranded, Mars and the Earth are not in a good alignment, and it will take 414 days for supplies to get there! Poor Watney. The increased time is due to two factors: waiting for a desired planetary alignment and the required flight time itself. So, Watney needs to wait well over a year for any supplies to arrive. This delay in time is a major driver of the book's nail-biting drama and compelling story. However, that delay could have been substantially reduced. In late 2014, my colleague Francesco Topputo and I published a new type of route to Mars. This route first appeared in the arXiv, then in Advances in the Astronautical Sciences, Volume 155, and then in Celestial Mechanics and Dynamical Astronomy. One of the more interesting aspects of this new route is that it is not necessary to wait for Earth and Mars to be properly aligned to launch the spacecraft. It can launch at any time. This is a major advantage. The transfer works in a substantially different way than the Hohmann version, in which the spacecraft travels directly to Mars. Here, the spacecraft is not sent to Mars. It is sent to a point along Mars' orbit about the sun, which can be chosen from a wide variety of points along that orbit, millions of kilometers from the planet. These points are trailing Mars as it orbits the sun, so the spacecraft slowly catches up to Mars. The spacecraft can be launched from Earth at the right time, depending on where the desired orbital point is located, using a Hohmann transfer. But there are so many of these points, the spacecraft can leave the Earth whenever desired, or conversely arrive at a point when desired. Now, when the spacecraft arrives at the desired point on Mars' orbit, it is trailing the planet in its orbit about the sun. The engines fire to do a maneuver that increases the speed of the spacecraft, relative to the sun, so the ship can follow a special trajectory from its location to Mars. This trajectory is called a ballistic capture transfer, or a weak stability boundary (WSB) transfer. Once the spacecraft is on this transfer, it takes an additional few months to catch up to Mars. Upon arrival at the planet, no more maneuvers are necessary, and the spacecraft is automatically captured into orbit (the ballistic capture). This is much safer than a Hohmann transfer, in which spacecraft need to substantially slow down using their engines, which can be dangerous (NASA's Mars Observer was lost due to this). The ballistic capture transfer could also be designed to go directly to Mars' surface. As it turned out in the book, the resupply craft never made it to Watney. However, if this type of transfer had been known, then the options to get a craft to Mars with supplies could have been executed on a different schedule, decreasing the chance of failure. With WSB transfer, a spacecraft with emergency supplies could have been put in Mars orbit about the sun in advance, before Watney and his crew arrived, ready to use in case of a mishap. It could have then been sent to Mars on a WSB transfer in a couple months. In the book, Watney's crew redirects its ship, Hermes, to Mars since the resupply ship didn't make it. The rescue spacecraft first had to perform a flyby of the Earth to gain the necessary speed to make it to Mars as fast as possible, using a Hohmann-like transfer. This resulted in non-desirable Mars arrival conditions, since the spacecraft was traveling much faster than normal. In this case, the transit time was 375 days. This is still 81 days in excess of the WSB transfer. Also, the WSB transfer would not have arrived with such a large overflight velocity as Hermes did in the book. As a result, it would not have been necessary to attempt the hair-raising, dangerous rescue for Watney depicted in the novel. The use of the WSB transfer would have clearly altered the course of this book, offering a number of different options for NASA and Watney. His life would have been much easier. Note: Meet Belbruno on Oct. 22 in New York at a Space.com gallery showing highlighting his work.